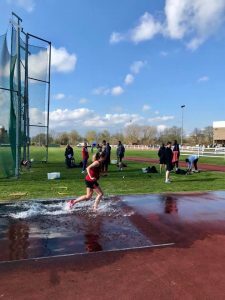 Newly promoted Medway and Maidstone AC men and ladies competed in their first Southern Athletic League Division 1 fixture at Medway Park, Gillingham on Saturday 13th April. Competing against Blackheath & Bromley, Crawley and Southampton they had an excellent start to the season finishing in 2nd place to a strong Blackheath squad. In the men’s event the track saw Tewelde Menges produce double victories in the 5000m and 2000m S/Chase ‘A’ races with times of 15.30.31 and 6.22.54 respectively. Chris Rampling was 2nd ‘B’ in 5000m in his first ever track race with 16.30.9. A competitive 800m saw Andrejs Safars 2nd ‘A’ with Jacques Cunningham-Marsh also 2nd ‘B’ before later going on to win the 2000 s/chase ‘B’ in a 6.50.12 pb. Andrejs also claimed ‘B’ victory in 110m hurdles where Lewis Heffernan won the ‘A’ race also finishing 3rd in a strong 400m Hurdles , 2nd in Triple Jump ‘A’ 12.32m and also recording a 6.03m pb for 2nd in ‘A’ Long Jump. There were 2nd places for Michael Major and Marley Godden in the 1500m, Joseph Burton was 3rd in 400m ‘A’ and 200m ‘B’. Ben Townend 3rd in 400m ‘B’ and good performances from Harry Osborne in the sprints 3rd places along with Rory Kuypers. The Pole Vault saw Ben Blake 2nd ‘A’ 3.10m and Andrejs Safars also 2nd ‘B’ 2.30m.In the high jump, youngsters Johnny Berry And James Butcher were 2nd ‘A’ and 1st ‘B’. Robert Mills had a ‘B’ triple Jump victory in 11.94m and 2nd place in ‘B’ long jump with a 5.56m pb. In the throws, Will Blake was 2nd ‘A’ in the Shot. In the Hammer U20 Reece Perkins, throwing senior weight for the first time in competition with a 33.93m for 2nd ‘A’ and Charles Flynn winning the ‘B’ 27.02m. Sonny Nash was 2nd ‘A’ in Javelin with 54.44 and Sean Rodwell also 2nd ‘B’ with 28.39m. In the relays our 4×400 squad (Townend, Blake, Burton and Safars) finished in 2nd place 3.33.34 and the 4×100 squad (Kuypers, Osborne, Heffernan, Townend) in 3rd. The ladies performed brilliantly for this first league competition with several U17s competing for the first time in the SAL and performing admirably. In the 100m, Darcey Kuypers showing great early season form racing to a season’s best to take 1st ‘A’ 12.23 with U20 Mayong Tabe 2nd ‘B’ 13.33. In the 200m, Darcey also gaining another season’s best 25.20 and her fastest 200m since 2014. Lucy Hope finished strongly for 2nd ‘B’ 26.99. In the 400m U17 Erin Hughes finished 4th ‘A ‘ in a pb 66.79 and U20 Lucy Maunders 3rd ‘B’ (67.94) both performing well. In the 800m U17 Charlotte Young 3rd ‘A’ 2.24.38 and U17 Billie Rouse running strong with a season’s best 2.25.27. In the 3000m Emily Hale 4th ‘B’ in 12.42.14 and Bernadette Harrop 3rd ‘B’ 13.24.11. Bernadette also competing in the 1500m 4th ‘A’ 6:16.39 and Mo Fazakerley 3rd ‘B’ 6:30.38. In the 2000m Steeplechase Bernadette also taking 2nd ‘A’ in 9:59.65 and newcomer to the track and Steeplechase, Catherine Rodwell, gaining valuable points 2nd ‘B’ 11:03.34. 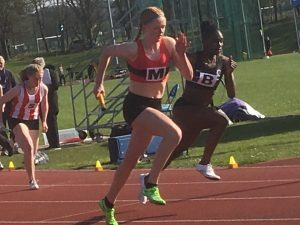 The 400H saw a great start to the season and PBs for both Emily Featherstone 2nd ‘A’ 67.54 and Katie Rothery 3rd ‘B’ 77.39. In the High Jump U17 athletes Gbemi Kasumu 3rd ‘A’ in 1.45m and Olivia Harrison 3rd ‘B’ 1.40m. In the Long Jump Mayong Tabe 1st ‘A’ 5.53m and Abigail Walters 2nd ‘B’ 4.43 and also contesting the 100m non-scoring with a strong run of 13.45. In the Triple Jump ,Gbemi Kasumu 2nd ‘A’ 9.63m and Grace Adeleye 2nd ‘B’ 9.08m. The 4x100m team finished in 2nd place with the team of Tabe, Hope, Walters and Kuypers in 50.83. In the 4x400m the team finished in 3rd place with the team of Young, Featherstone, Hope and Wastell finishing in 4.08.7. A non scoring team of Rouse, Kasumu, Maunders and Hughes also running well in 4.27.25. 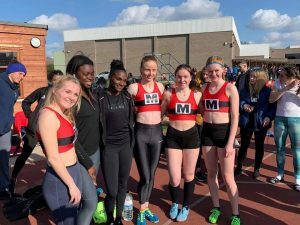 The highlight for the 4×4 teams were getting to compete against Bromley & Blackheath superstar, Dena Asher-Smith, taking time out to compete for her club and also letting the athletes take photos afterwards.